February 7th marks one year until the opening ceremony1 of the 22nd Winter Olympics, taking place in Sochi in Russia’s far southwest. with the 11th Winter Paralympics starting a month later. We’ll preview the eleven competition venues, beginning with the ‘coastal cluster’ of facilities around the brand new Sochi Olympic Park. 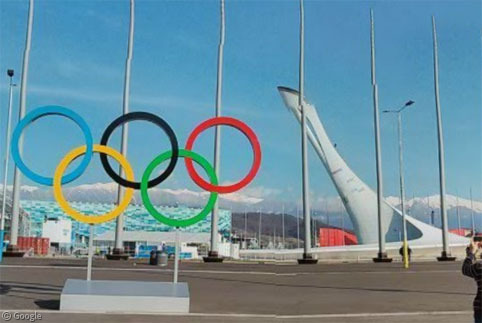 Located about 20km south-east of the city itself, and only a kilometre or so from the border with Georgia, Sochi Olympic Park will include six purpose-built venues and a plaza for medal presentations. 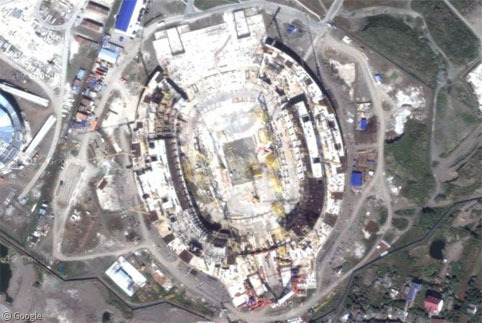 Shown under construction on Google’s current satellite imagery, the venues should all now be complete and ready for test events taking place this year. 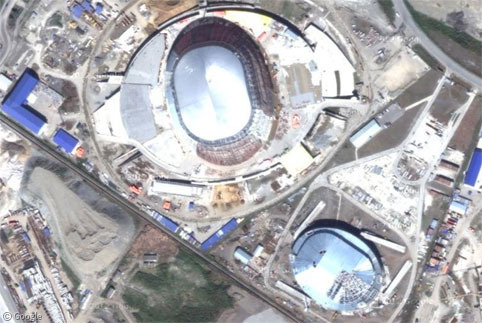 The largest venue is the 40,000 seat Fisht Stadium which will host the opening and closing ceremonies. Named for a nearby mountain, the building will later be converted to a football stadium for use during the 2018 World Cup. The open stadium affords spectators spectacular views of the Black Sea in one direction and the Krasnaya Polyana mountains in the other – a roof is not needed because of the mild winters in the city. It is claimed that Sochi will be the warmest city ever to hold the Winter Olympics (it’s roughly the same latitude as Nice in the south of France! ), with average February temperatures in the city well above freezing, and rain far more common than snow. Working clockwise around the plaza from the stadium, we next come to the Shayba Arena and Bolshoy Ice Dome – ice hockey arenas respectively holding 7,000 and 12,000 spectators. 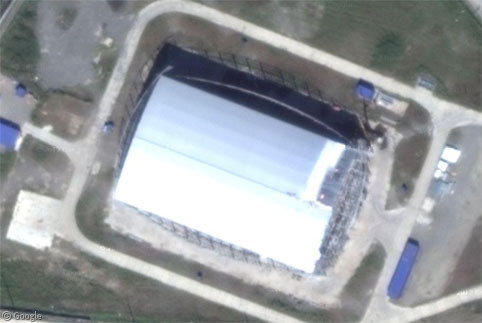 While the Bolshoy (major) Ice Dome is a permanent facility, the Shayba arena is only a temporary structure and will be moved elsewhere after the Games. Shayba apparently means hockey puck, though the building is clearly not made of black rubber, and nor is it 76mm in diameter. The smallest venue in the Olympic Park is the Ice Cube Curling Centre with room for 3,000 fans of a sport which involves sliding rocks around. Sadly, the building was apparently named for its squareish shape and indoor ice surface, rather than honouring the famous NWA rapper. Continuing around, we reach the 8,000 seat Adler Arena Skating Centre, where the long-track speed-skating events will take place. 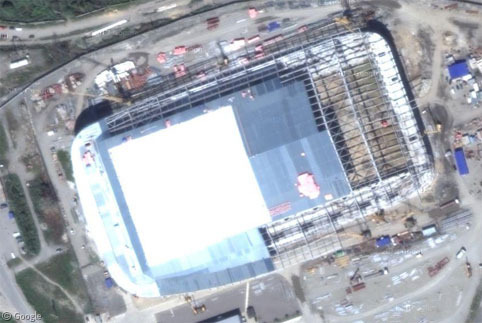 Finally, the Iceberg Skating Palace – a 12,000 seat building which will host figure-skating and short-track speed-skating competitions (though disappointingly not at the same time). Apparently named for its gleaming glass windows and natural form, and not because it is likely to sink passing steam ships. A Formula 1 circuit is being constructed around the site in conjunction with the Olympic venues, with the first Grand Prix scheduled for a few months after the Games. Though in a battle of sports mega-egos, it has been revealed that Jacques Rogge and the IOC have even more clout than Bernie Ecclestone and the FIA, because the debut race will be delayed a year if there is any risk of track construction interfering with the Olympics. 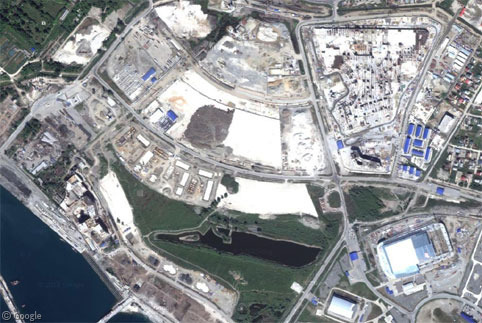 To the west of the Olympic Park, the Athletes village will occupy a stretch of land along the Black Sea shoreline, and a triangular-shaped area inland. 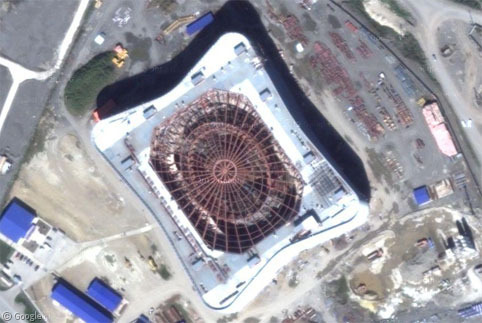 Construction had only just begun when this imagery was captured. The media centre will be in this area as well. 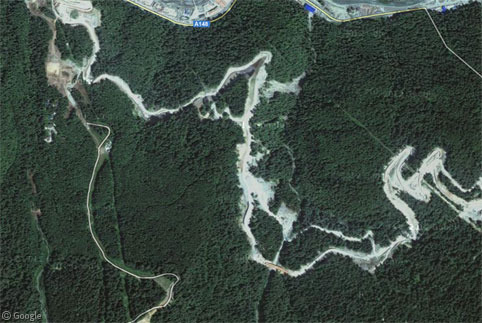 The ‘mountain cluster’ of venues is about 50km inland from Sochi. Games organizers are hoping that winter here is more reliable than in the city, although the current winter has been much milder and less snowy than normal. 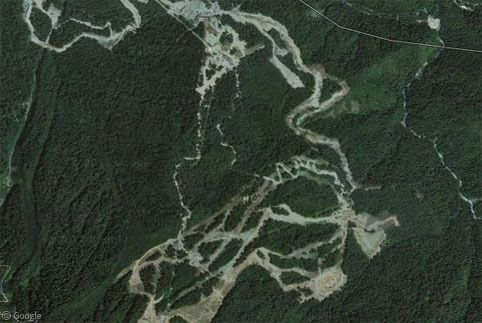 The CBC has this startling story that piles of artificial snow will be stockpiled through the rest of this winter, then covered with thermal blankets, with the expectation that 60-70% of it will survive the summer and be available to line the slopes early next winter. Alpine ski and snowboard events will take place at the Rosa Khutor Resort, with freestyle competition being held in the ‘extreme’ part of the venue with seating for 8,000. The village for mountain athletes will be located near this resort as well. With all the other creative venue names, the best they could come up with for the nordic skiing venue was the Biathlon and Ski Complex, which is a short distance to the north of Rosa Khutor. There will be seats for almost 10,000 spectators. You’ll have to use your imagination for the final two venues which are only shown in the very early stages of construction. 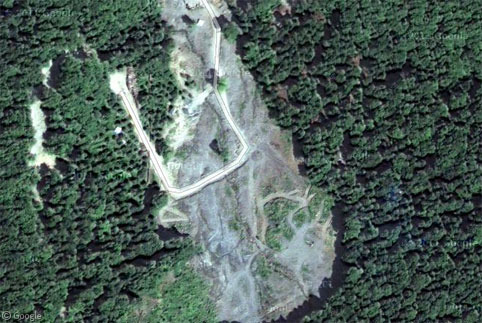 A pair of soaring ski jump towers will occupy this barren patch of ground destined to be the RusSki Gorki Jumping Centre. Finally you can follow the sinuous course of the bobsleigh/skeleton/luge track at the Sliding Centre Sanki, though only parts of the structure are in place. 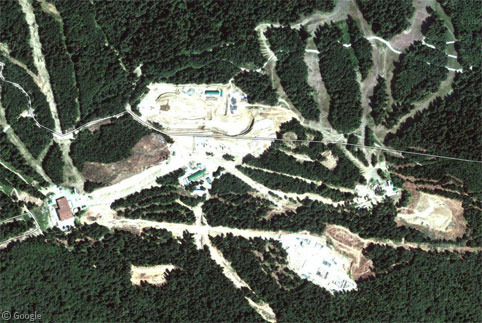 This is the site of just one of a number of controversial issues surrounding the games – the sliding track is cut through sensitive forest home to an endangered species of bear, though it’s not clear if the organizers are more concerned about impact of human activity on the bears, or if the bears could be a threat to spectators and athletes. The Guardian has a summary of other controversies, claiming the construction process “to be one of the most corrupt projects in Russia’s history”. 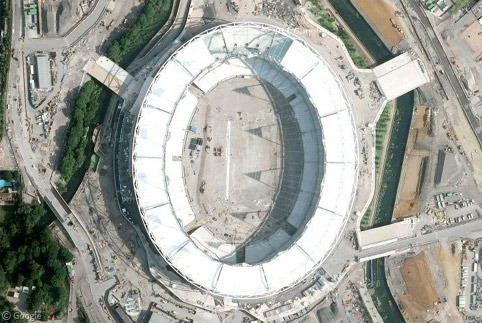 Hopefully Google will treat us to updated imagery before the Games, and we’ll be able to make a more detailed post. For now, you can learn more about the Sochi Winter Olympics at the official site, or at Wikipedia. The CBC has a short video and blog reviewing the venues, while the BBC also has a one-year preview of the Games.